In this post we will study about Divergent Boundary (Divergent plate boundary or Constructive Edge). We will study about the important land forms created due to divergent boundary. These important land forms include the East African Rift System, Rift Lakes, Great Rift System etc.. We will also study the formation and evolution of Rift Valley, Linear Sea, Oceans etc..
Major geomorphological features such as fold mountains, block mountains, mid-oceanic ridges, trenches, volcanism, earthquakes etc. are a direct consequence of interaction between various lithospheric plates. 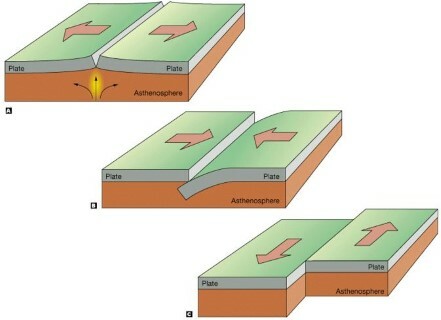 There are three ways in which lithospheric plates interact with each other. Divergence: Divergent boundary is also called as constructive edge. Mid-oceanic ridges, rift valleys, block mountains, etc. are the common landforms formed due to divergence. Convergence: Convergent boundary is also called as destructive edge. Fold mountains, trenches, island arcs, continental arcs, etc. are the common landforms formed due to convergence. Transcurrent boundary or transform edge: Here the landform is deformed due to the horizontal grinding (plates slide past each other horizontally) of the lithospheric plates. Example: San Anderas Fault, USA. In the See Floor Spreading theory, we have studied how divergent boundaries below the oceans are responsible for the spreading of the see floor. In Plate Tectonics, we have learnt about the major and minor lithospheric plates and how these plates moved thorough the geological past. We have studied about convection currents in the mantle which are the primary reason behind plate movements – divergence (divergent boundary) and convergence (convergent boundary) of the lithospheric plates. The horizontal limbs of the convection currents, just below the lithosphere, drag the plates horizontally. The falling limbs of the convection currents create a negative pressure on the lithosphere and this negative pressure (pulling force) is responsible for the formation the convergent boundary. The rising limbs on the other hand create positive pressure on the lithosphere and this positive pressure (pushing force) creates a divergent boundary. Divergence (divergent boundary) is responsible for the evolution and creation of new seas and oceans just like convergent boundaries are responsible for the formation of fold mountains, volcanic arcs (few exceptions like Hawaii) etc.. The formation of atmosphere and the oceans took millions of years. They were formed due to continuous ‘degassing’ of the Earth’s interior [denser elements settled at the center of the earth and the lighter elements at the surface]. After the Earth’s surface temperature came down below the boiling point of water, rain began to fall. Water began to accumulate in the hollows and basins and the primeval [of the earliest time in history] water bodies were formed. The primeval water bodies evolved to form seas and oceans. The process of formation of a new sea begins with the formation of a divergent boundary. New lithosphere is created at the divergent boundary and old lithosphere is destroyed somewhere else at the convergent boundary. Up warp: Geology a broad elevated area of the earth’s surface. 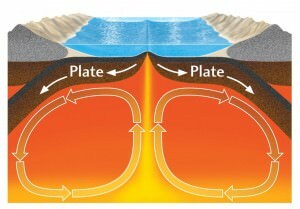 Plume: Geology a column of magma rising by convection in the earth’s mantle. Rift Valley: A rift valley is a linear-shaped lowland between several highlands or mountain ranges created by the action of a geologic rift or fault. Rising limbs of the convectional currents create a mantle plume that tries to escape to the surface by upwarping the lithosphere. During upwarping, a series of faults are created. Both normal and thrust faults (reverse fault) occur during upwarping. Divergence of plates begin. Faulting due to divergence creates extensive rift system (fault zones, rift valleys). Rifting is followed by flood basalt volcanism in some places that spread around the rift creating plateaus, highlands etc.. East African Rift Valley is at this stage of evolution. Rift valley deepens due to further divergence and makes way for ocean waters. If the rift valleys are formed deeper within the continents, rains waters accumulate forming rift lakes. Rift lakes form some of the largest fresh water lakes on earth. Rift valleys evolve into volcanic vent. Block mountains on either side of the rift evolve into oceanic ridges. Successive volcanism and see floor spreading creates spreading sites where new crust is formed (This is the reason that a Divergent Boundary is called a Constructive Edge). Oceanic crust starts to replace continental crust. This stage is the formation of linear seas. Example: Red Sea. Most of the narrow seas are at this stage. Intense outpouring of basaltic magma accentuates see floor spreading and oceanic crust formation. 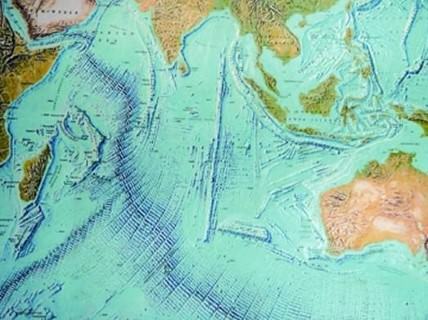 Oceanic crust replaces the continental crust and a mighty ocean is formed. Crust formation along the mid-oceanic ridge (divergent boundary) is compensated by crust destruction (crustal shortening) along the convergent boundary (Destructive Edge). This is exactly how the continents and oceans get transformed. A rift lake is a lake formed as a result of subsidence related to movement on faults within a rift zone, an area of extensional tectonics in the continental crust. They are often found within rift valleys and may be very deep. Rift lakes may be bounded by large steep cliffs along the fault margins. Many of the world’s largest lakes are located in rift valleys. Lake Baikal in Siberia lies in an active rift valley. Lake Baikal is the largest (by volume) freshwater lake in the world, containing roughly 20% of the world’s unfrozen surface fresh water. Lake Tanganyika, second by both measures, is in the Albertine Rift, the westernmost arm of the active East African Rift. Lake Superior in North America, the largest freshwater lake by area, lies in the ancient and dormant Midcontinent Rift. The EAR began developing around the onset of the Miocene, 22–25 million years ago. In the past, it was considered to be part of a larger Great Rift Valley. 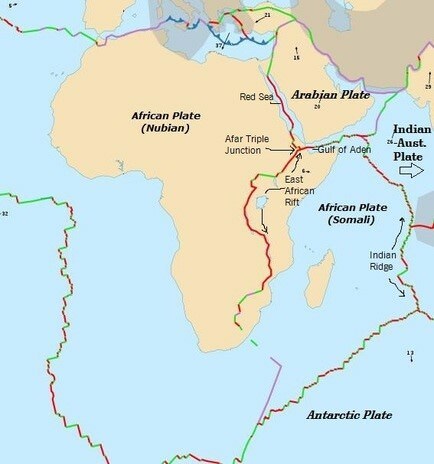 The rift is a narrow zone that is a developing divergent tectonic plate boundary, in which the African Plate is in the process of splitting into two tectonic plates, called the Somali Plate and the Nubian Plate (African Plate), at a rate of 6–7 mm annually. 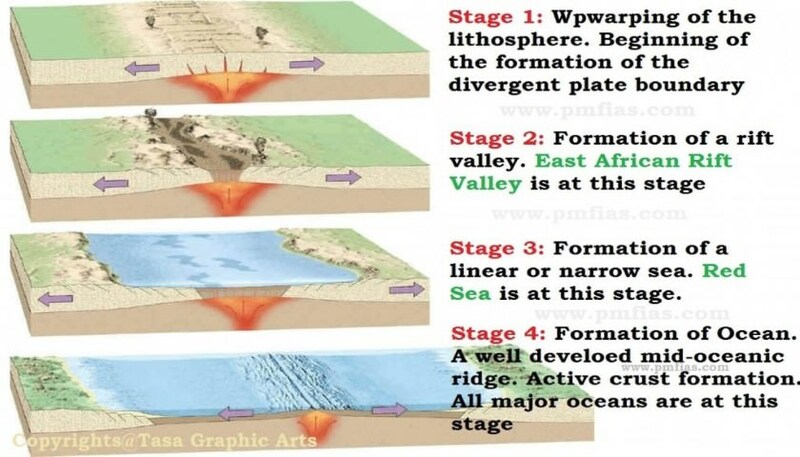 As extension continues, lithospheric rupture will occur within 10 million years, the Somalian plate will break off, and a new ocean basin will form. The Eastern Rift Valley (also known as Gregory Rift) includes the Main Ethiopian Rift, running eastward from the Afar Triple Junction, which continues south as the Kenyan Rift Valley. The Western Rift Valley includes the Albertine Rift, and farther south, the valley of Lake Malawi. To the north of the Afar Triple Junction, the rift follows one of two paths: west to the Red Sea Rift or east to the Aden Ridge in the Gulf of Aden. The EAR transects through Ethiopia, Kenya, Uganda, Rwanda, Burundi, Zambia, Tanzania, Malawi and Mozambique. The East African Rift Zone includes a number of active as well as dormant volcanoes, among them: Mount Kilimanjaro, Mount Kenya. Although most of these mountains lie outside of the rift valley, the EAR created them. The EAR is the largest seismically active rift system on Earth today. The majority of earthquakes occur near the Afar Depression, with the largest earthquakes typically occurring along or near major border faults. The Great Rift Valley is a geographical feature running north to south for around 6,400 kilometers from northern Syria to central Mozambique in East Africa. The northernmost part of the Rift forms the Beqaa Valley in Lebanon. Farther south, the valley is the home of the Jordan River which continues south through the Jordan Valley into the Dead Sea on the Israeli-Jordanian border. From the Dead Sea southward, the Rift is occupied by the Gulf of Aqaba and the Red Sea. The Afar Triangle of Ethiopia and Eritrea is the location of a triple junction. 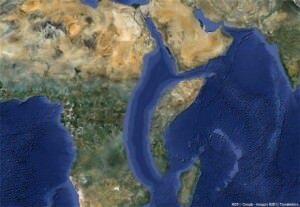 The Gulf of Aden is an eastward continuation of the rift and from this point the rift extends southeastward as part of the mid-oceanic ridge of the Indian Ocean. In a southwest direction the fault continues as the Great Rift Valley, which split the older Ethiopian highlands into two halves. In eastern Africa the valley divides into the Eastern Rift and the Western Rift. The Western Rift, also called the Albertine Rift contains some of the deepest lakes in the world (up to 1,470 meters deep at Lake Tanganyika). A transform fault or transform boundary, also known as conservative plate boundary since these faults neither create nor destroy lithosphere. The effect of a fault is to relieve strain, which can be caused by compression, extension, or lateral stress in the rock layers at the surface or deep in the Earth’s subsurface. Most transform faults are hidden in the deep oceans. Many transform faults are located on the continental margins as well. The best example is the San Andreas Fault on the Pacific coast of the United States.